At about 8 am on any given morning, it’s unusual for the only life at a Cape Town beach to be a few seagulls flying overhead. Even though the water temperature in False Bay ranges from a refreshing 13 °C to a more bearable 21 °C, the bay is renowned for open-water swimming, surfing, diving and many other water-related recreational activities. Yet odd as it may seem to have gulls as my only companions on Fish Hoek’s main beach, I can understand why. Between 2003 and 2005 there were four shark bites in Cape Town, three of which were fatal. Shark bites are high-profile events and are traumatic not only for the victims and their families, but also for the local community. Silhouettes of Fish Hoek’s silent heroes. Shark Spotters, an NGO that operates the primary shark safety programme in Cape Town, recognised that a solution was needed to alleviate people’s fear while simultaneously not harming sharks, the environment or other species in the process. That solution turned out to be a shark exclusion net. Setting up the shark exclusion net. The exclusion net is fine-meshed, made up of 3cm x 3cm diamond shapes that greatly minimise the chances of entanglement. It stretches from the surface of the water to the sea floor, preventing marine life from entering the exclusion zone (and humans from leaving it). View this link for a better understanding of how it works. 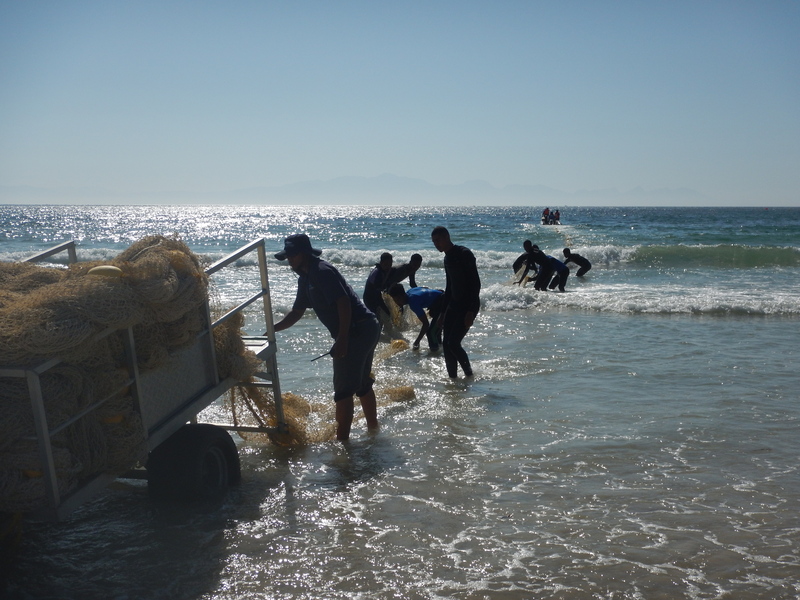 Deploying the net is a labour-intensive process and a team of individuals from the Fish Hoek community is employed to set it up at 9am and take it down by 5pm daily, unless weather conditions prove too difficult. 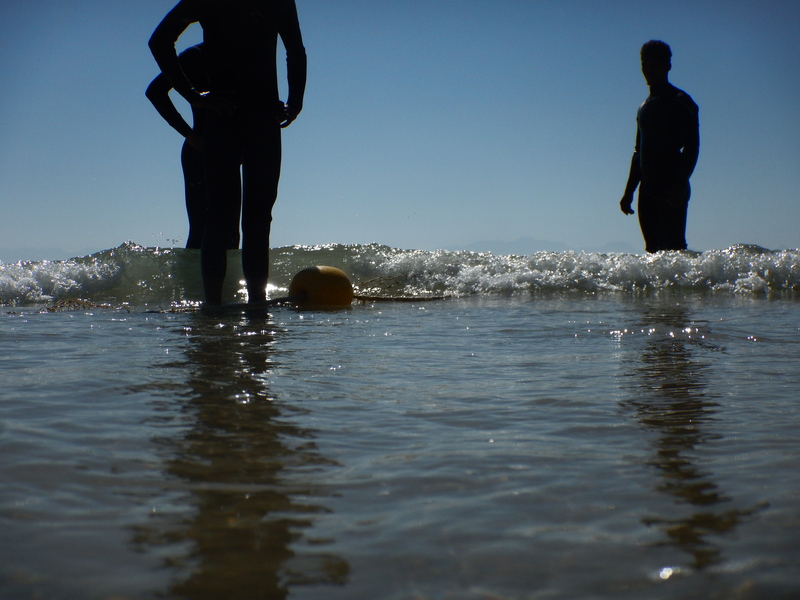 Sarah Waries, the Shark Spotters’ project manager, explained that this environmentally safe and responsible mitigation device was first deployed at Fish Hoek beach in 2013. Since then it has given many a beach-goer peace of mind when entering the water. Big thanks go to the City of Cape Town and the Save Our Seas Foundation, which have supported Shark Spotters in seeing this project to fruition. 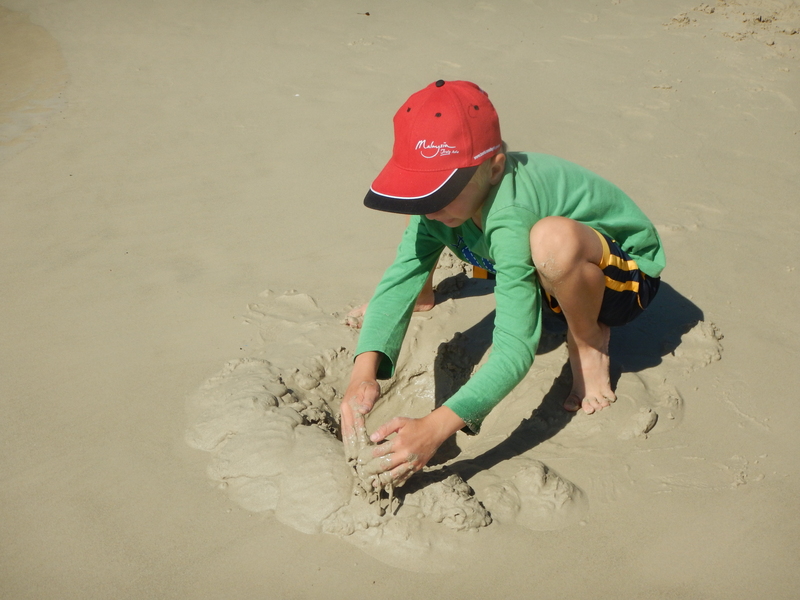 People of all ages are basking in the sun, making sand castles or mimicking whales’ breaching behaviour in the water.